Midnight Sunlight (#5) defeating Mr Shakem Diva (#2) and Bp Painted Lady (#9) in the Northlands Futurity at Canterbury Park. SHAKOPEE, MN�JULY 5, 2012�Midnight Sunlight won the $59,800 Northlands Futurity Thursday at Canterbury Park in a sister-brother battle of owners that resulted in a photo finish. The Texas-bred 2-year-old quarter horse filly owned by Brenda Reiswig of Bismarck, North Dakota closed ground to win the photo by a nose over longshot maiden owned by Reiswig's brother, David Wisdom of Mandan, North Dakota. Winning owner Brenda Reiswig accepting the Northlands Futurity trophy with trainer Vic Hanson and jockey Stormy Smith. "It's all in fun," Reiswig said. "But it's a lot of money. This is such a nice filly." 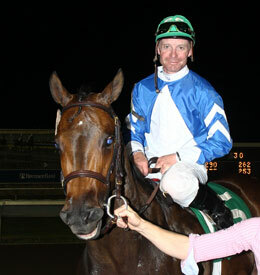 Midnight Sunlight provided trainer Vic Hanson with his first Northlands victory. Jockey Stormy Smith rode the Ivory James filly to a final time of 17.843 seconds for the 350 yards. Midnight Sunlight paid $15.40 to win. In March, Midnight Sunlight was the fastest qualifier for the Grade 2 Oklahoma Futurity and finished second in the final. She was the fourth fastest qualifier for the Northlands. Bobby D. Cox bred the filly from the Royal Quick Dash mare Quick Moon Sign. With a 2-2-0 record in five starts, she's earned $98,074. "We knew we had a very nice filly. We just got her a little tired," Hanson said. "The trials are the trials. This was for the money." 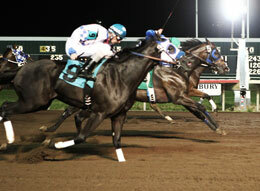 Jockey Stormy Smith returns aboard Midnight Sunlight after winning the Northlands Futurity at Canterbury Park. The second-place finisher was ridden by Clyde Smith and trained by Edward Ross Hardy. The homebred gelded son of Royal Shake Em is out of the This Snow Is Royal mare Ms Devine Diva. Mr Shakem Diva has placed second three times in four starts and earned $13,950. Finishing third was 2 to 5 favorite Bp Painted Lady and jockey Cody Smith. The filly, trained by Amber Blair, was bumped after breaking from the gate and rallied to finish a head behind Mr Shakem Diva. 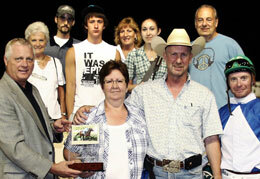 The Pyc Paint Your Wagon filly races for Movin On and was bred in Oklahoma by Bill Price. Out of the First Down Dash mare Lady Is First, she has earned $31,434. Completing the field were Nn Absolutley, Eye A Hero, Lynns Wagon, Sr Ivory Queen, Naked Spur and Jess That's Blazin. Traffic Patrol was scratched.